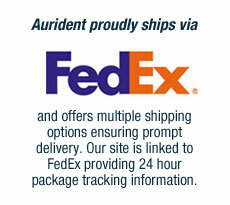 Aurident’s original biocompatible, palladium-free Type II crown and bridge alloy. Over 25 years of proven reliability. Polishes to a deep lustrous gold color. Designed for inlays, single units and short span bridges where biocompatibility is essential. BH’s unique composition results in a rich yellow color, producing castings with superior physical and mechanical properties. 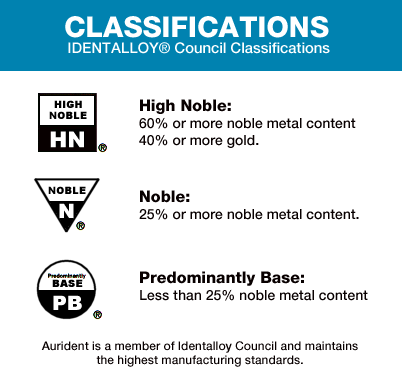 Aurident’s BH is a high noble, finegrain, type III crown and bridge alloy containing 64% gold, 3% palladium and 23.4% silver. Its high yield strength and substantial elongation make BH suitable for single units and long span bridges. The ease of casting and workability have made BH one of Aurident’s most popular gold crown and bridge alloys. Containing 56% gold, 28.2% silver and 4% palladium, QH combines a rich, yellow color, tarnish resistant formula and extremely high burnishability to make this alloy the ideal choice for crowns and bridges where quality and economics are major considerations.